Two thousand ten was an exciting year for the Suzuki Association of Peru. In addition to celebrating twenty-five years of offering Suzuki festivals in Lima, for the first time in its history, a very special event was held. 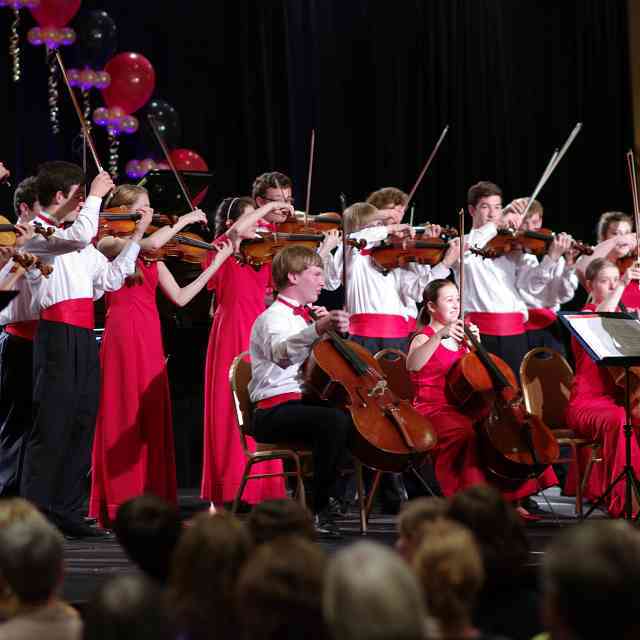 A youth orchestra was organized, formed of Suzuki students from all over Latin America. 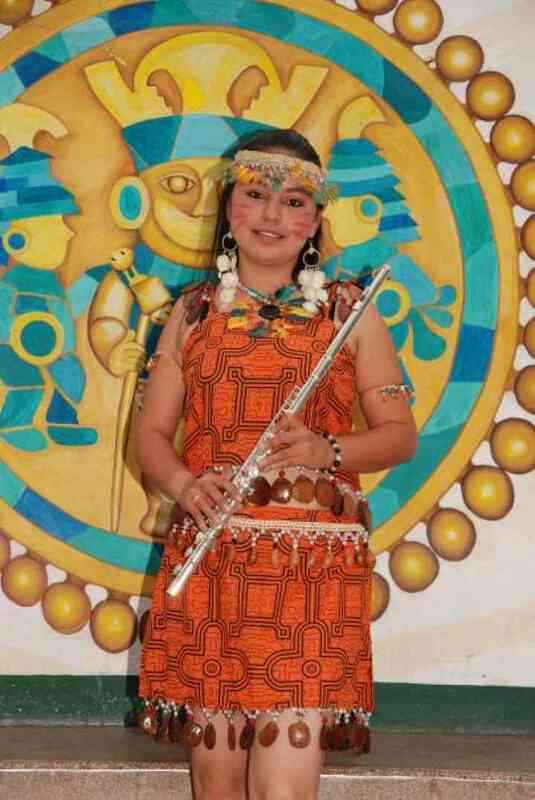 Music from various countries was arranged for all of the students to play, and members of each contingent participated in the performances wearing the national costume of their own country. It was a spectacular event, and so successful that plans were immediately made to hold another in 2015. It was heartwarming to see the children come on stage, each proudly carrying their country’s flag. The smallest Latin-American “delegation” was from Ecuador. It included four-year-old flutist Carlos and his teacher, Eugenia Aizaga, who coached the six flutists in the orchestra. Carlos was not yet old enough to play in the orchestra, but his enthusiastic singing was very notable in the concert. Another warm moment was the inclusion of the American flag, carried by the lone participant from the US, David Morales Boroff, and his mother, Sylvia Morales. David was a piano student of Doris Koppelman’s; he presented a solo piano concert as part of the festival events, and also played the violin in the orchestra. It was wonderful to see students and teachers from the entire region of the SAA involved in this celebration. Daniel has taken my [violin pedagogy] courses, which is where I first met him. He is so intelligent and is a terrific teacher. He has a program in Iquitos, but also travels by boat up and down the river visiting villages and trying to get the children involved in playing. And through this, the philosophy also gets to the parents. This is a very difficult task. Instruments are not easy to come by, and he does have to carry instruments with him on the boat. I had this picture in my mind as we made this trip, and indeed made the trip particularly meaningful to me. 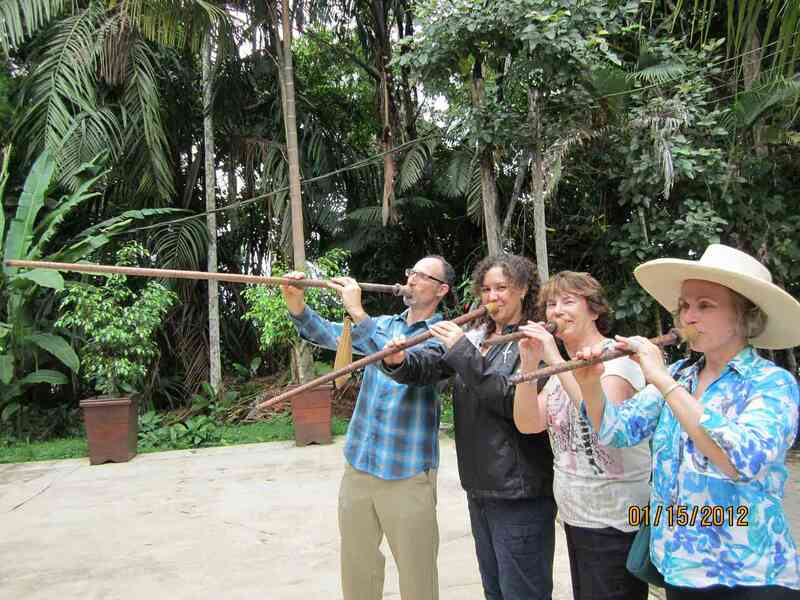 Five teachers traveled to the Amazon in between the two weeks of the 2012 Suzuki Festival in Lima. Helen Brunner, David Evenchick, Nancy Lokken, Mary Halverson Waldo and I made the most of the five-day interval to get a glimpse of this exciting part of Peru. As our guide Abelardo told us, people tend to think of Brazil when they think of the Amazon, but the great river starts in Peru, its source high up in the Peruvian Andes. As we rode through the city of Iquitos in a tour bus, Abelardo gave us a great deal of further information about the region, including the large number of indigenous languages spoken in the Peruvian Amazon alone. Nancy: There are no roads to Iquitos. You can only access the city by plane or boat. If you take the latter it would be about a forty-eight-day trip from Lima, traveling around Brazil to the opening of the Amazon River that will eventually get you to Iquitos. Iquitos is a very noisy city, and lively. 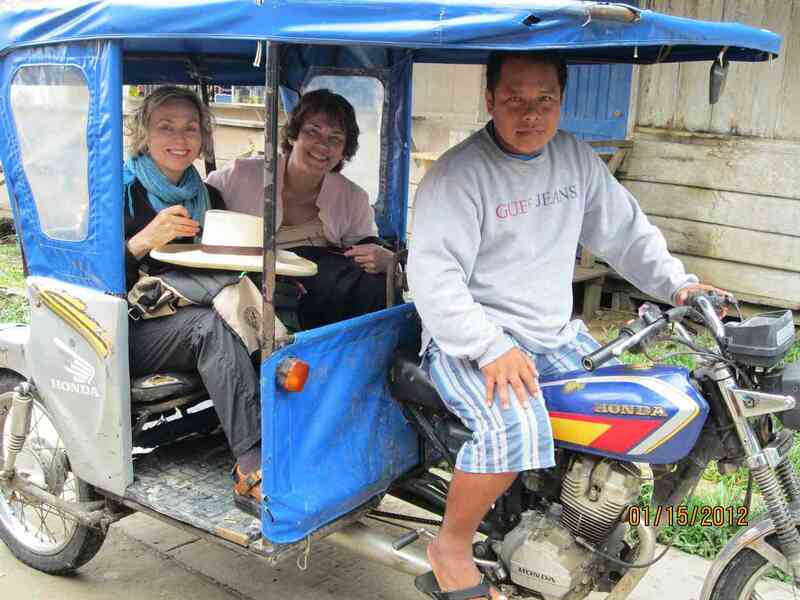 Most people ride motorcycles or take the three-wheeled motorcycle taxi to get around. Abelardo pointed out that this was because larger vehicles needed to be brought to Iquitos by boat, due to the absence of roads. Having been told this, I was surprised that there were any large vehicles at all! But of course, there were—trucks, construction vehicles, and all types of vehicles necessary to a major city like Iquitos, which has been a center of production for various industries. In addition to the rubber boom of the 1880s, oil was discovered in the 1960s. Tourism has become increasingly important. as well. We passed many buildings that still displayed ceramic tiles which were imported from Europe during the days of the rubber barons. Our trip was enormously educational and eye-opening, and much of the credit for that is due to Abelardo. As Nancy said, we were really blessed to have Abelardo as our guide. A self-described “jungle boy,” Abelardo grew up in a village along the banks of the Amazon where he learned to imitate the calls of the birds and make an interesting sound that calls the river dolphins. But more about the dolphins later! David: When we told Abelardo that we were music teachers, there seemed to be an immediate sense that all of us were of kindred spirit. First of all, he has cultivated learning by ear, an ear attuned to nature’s sounds and birdcalls. Abelardo had liked the teacher who visited his village, and helped him with chores such as taking things to and from the teacher’s boat. The teacher rewarded Abelardo with some funds, helping him to make a difficult decision to leave the village and go to the big city, Iquitos. Iquitos, however, was not an easy place to survive for someone without urban work experience. He ended up driving a typical three-wheeled Iquitos taxi for the desolate midnight to early-morning shift because he lacked an official taxi permit to work during the day. With so few taxi customers, Abelardo was at a dead end. He then went to the Explorama Tours office in Iquitos to ask for a job, and was told to come back in a month’s time. He returned, only to be told to come back yet another time. He did this several times before he was finally offered an entry-level job performing manual tasks such as carrying guests’ suitcases. Abelardo took every opportunity to work his way up to better positions and with the mentorship of an experienced guide, the aid of an ever-present dictionary for late-night study, and attentive listening to the tourists, was eventually able to master enough English to become a guide himself. In addition to being a very valuable assistant to the serious bird-watchers with his knowledge of the various bird calls, he knew both the Latin and English names of all of the local flora and fauna. While we were there it was evident that he, in turn, was mentoring other workers at Explorama’s Ceiba Tops Lodge, helping them to improve their English or supporting them in other ways. David: We found him to be so much more than a guide—an environmentalist, a historian, a botanist, an anthropologist, and a life-long learner. When we arrived at the dock at Ceiba Tops, we learned something else about the Amazon: the stairs up from the pier were painted with dates. Each step indicated the height that the water had reached in that particular year, because as Abelardo told us, in the Amazon, there are not seasons as they are known in other parts of the world. There is only the high-water season and the low-water season. It was amazing to compare the difference between the two, and the differences from year to year as well. This change in water levels has had an unfortunate result for at least one resident of the Amazon. The piranha has a reputation for being a ferocious and ravenous creature. Abelardo explained that when the water levels drop, piranhas can become isolated in little lagoons where, once they have exhausted the available food supply, they are indeed likely to devour anything that falls into their domain. At high-water periods, however, the piranhas are like any other fish, and they are eaten and enjoyed by the local people. Certainly piranhas have very sharp teeth; when we visited a village of the Yagua people, the chief showed us how the jaws of piranhas were used to sharpen the darts that the hunters use in their blowguns. We traveled by boat to a village where we watched a traditional native ceremony, with all members in their traditional attire. During one of the ceremonial dances, we were invited to try the dance and see if we could follow the steps. I was grateful that a young girl invited me and not the chief! We mingled with them afterward, buying some of their crafts that were hanging around the ceremonial hut, and watching them shoot the hand-made blowguns that they use for hunting. We were able to try the blowguns ourselves and see if we could hit the targets. I was surprised when on my first attempt, I hit the target right in the eye. Encouraged to try again, however, my skill was no better than anyone else’s (aside from the Yagua themselves)… as Helen pointed out, I needed to do it the requisite 10,000 times to develop true ability. Nancy: I discovered that the rain sticks literally create the sound of the rain in the jungle! In this village I was able to buy a crude rain stick decorated by a villager with pictures of a fish. I think it is the best sounding rain stick I have been able to buy and carry home. We learned more about traditional knowledge and customs of the indigenous people when we visited a shaman’s hut as another excursion. Entering a thatched lodge with open walls, we sat on benches around the edges. I was grateful for the palm-leaf fans that we were given—as soon as we entered the still air of the lodge and stopped moving, we were sitting targets for the many mosquitoes that inhabit the rainforest. An excellent presentation followed, given by a young man trained in the uses of the various medicinal plants. He explained that the people of the Amazon don’t worry much about malaria and other diseases; the number one cause of death in the region is snake-bite. He showed us various plants and decoctions, including a little yellow flower like a marigold which we were invited to chew. My mouth and tongue immediately tingled and then became numb; the effect was surprisingly powerful. David and another visitor were invited to come forward and participate in a ceremony during which the shaman chanted and blew smoke around them. It was very interesting to see how local people are working to preserve their own traditions and way of life, while accommodating the outside world. David: Not knowing when my next visit to a shaman would be, I was happy to submit to his treatment. This ritual included some sonorous chanting, inhaling second-hand smoke from a luxuriously-scented local cigarette, and the occasional whack on the head with his bundle of dried palm fronds. The experience is difficult to describe because it felt like—nothingness. I was bemused at the time and it is difficult for me to recreate this feeling. Our visit to the “Monkey Island” was another example of a balancing act between the Amazon region and the outside world. A local family is developing a preserve to protect jungle animals from poachers. 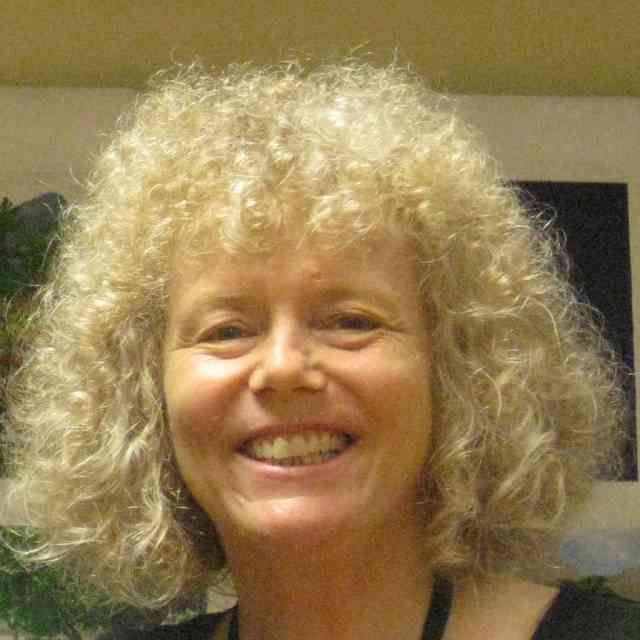 Nancy: The workers care for these animals and birds until they are able to safely return to the jungle. When we arrived it was truly magical. 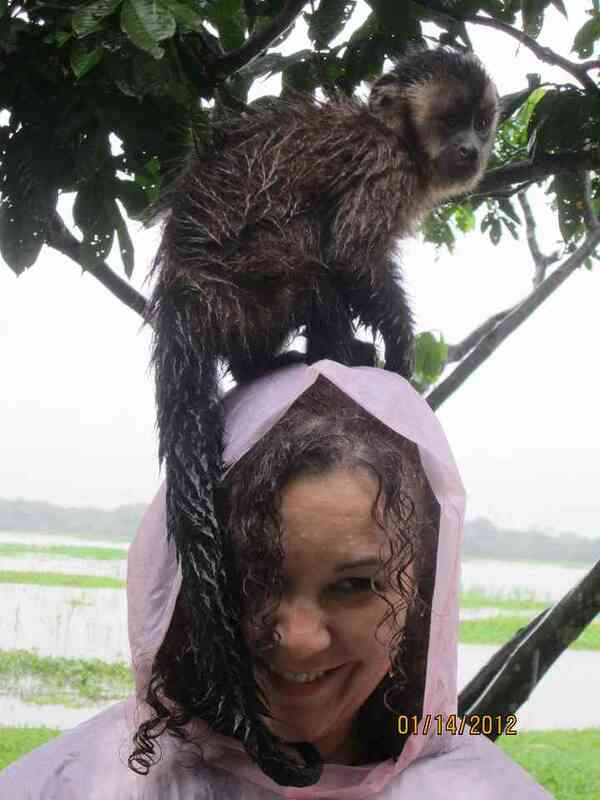 We were met by several varieties of monkeys who happily climbed on us. One balanced on Kelly’s head, and another tried to share a banana with David while perched on his arm. The monkeys are very curious, so all bags have to be closed. We discovered that monkeys know how to undo zippers, so no backpacks were safe from their inspection! It was rainy, and grass and walks were muddy. By the time we left, my tennis shoes were so dirty from monkeys sitting on my shoes and playing with the laces! After the monkeys came an encounter with a sloth. We noticed she was curled up in a tight ball in a tree. One of the caretakers took her down and let us hold her. She moves very slowly and has huge long claws. I am glad I didn’t know at the time how many parasites sloths carry! Then we came to the anaconda, the largest snake I have ever seen. I am glad I don’t have to feed it! Across the large grassy area that runs along the riverbank, we came to an open air porch to rest. While we were there, we watched the toucans fly in and out and then perch on the railings. Their beautiful beaks looked like they had been painted with vivid colors. When we were traveling on the river along the little estuaries between excursions, Abelardo would periodically stop the boat to try to entice the river dolphins to come, using a piping whistle. The first time he did it, it was quite exciting, and we waited expectantly for the dolphins to appear. As a couple of days went by, it started to seem like these pink dolphins were more myth than reality. But there was so much else to see and learn, and in so few days, that I began to put the dolphins out of my mind. I did buy a small carving of a river dolphin at the Yagua village… whether we saw them or not, they are an icon of the great river and worth adding to our list of memories. As we walked along the pathways, we could look far down at the forest floor and also into the trees, where liana vines and all kinds of bromeliads and epiphytes were growing. I keep some of these plants in pots at home, and it was really cool to see them in their natural habitat. By the time we reached the highest point, a gentle rain was falling. The view over the tops of the trees with the mist of rain was truly breathtaking. As peaceful as it was, it also ended up being somewhat exciting for me, as I got bitten by an unknown kind of insect. We were all covered by the pastel plastic rain ponchos that had been provided by the lodge. (Mine was baby pink—very fashionable.) In addition, I had on a long-sleeved jersey top underneath and a light rain jacket over that. Nevertheless, a bug took advantage of my inadvertently brushing against a tree trunk, crawled up inside my clothes and bit me on the inside of my arm close to my elbow. I never saw the bug itself, but the fiery sensation stayed with me for several hours, despite the cortisone cream which a fellow tourist kindly lent me to anoint my poor arm. Luckily this was the extent of our insect encounters: Adriana, the president of the Suzuki Association of Peru, had told us some very scary stories about rainforest insects from an excursion she had made much deeper into the Peruvian Amazon. Her accounts made my own bug story seem pretty tame. Traveling to and from the site of the canopy walk, we coasted through narrow channels in our small motorboat. Abelardo and the boat captain pointed out various sights of interest—most spectacular were the huge and luminous blue morpho butterflies, of which we saw several flitting past and overhead. I’m sure I speak for all of us when I say that the excursion into the canopy was over all too quickly. Never were five days more packed with experiences. At the lodge in the evenings, we enjoyed listening to the Ceiba Tops band (formed of guides and other employees). The fauna around the lodge included parrots and other birds, monkeys, a little deer, and a baby tapir, which we petted and took each others’ photos with. We even went fishing for piranhas and caught one small one, in addition to a couple of other fish, also small. Nancy: The boat captain really had the technique: splash and stir the top of the water with the tip of the rod [stick], and then lower the baited hook and wait. We caught collectively two catfish and one red piranha. Our guide offered to have them cooked for lunch for us, so we took him up on it. There wasn’t much meat on them, but I think I preferred the piranha in taste. Our trip included yet another excursion (first by boat, then by three-wheeled taxi) to a nearby town along the river. 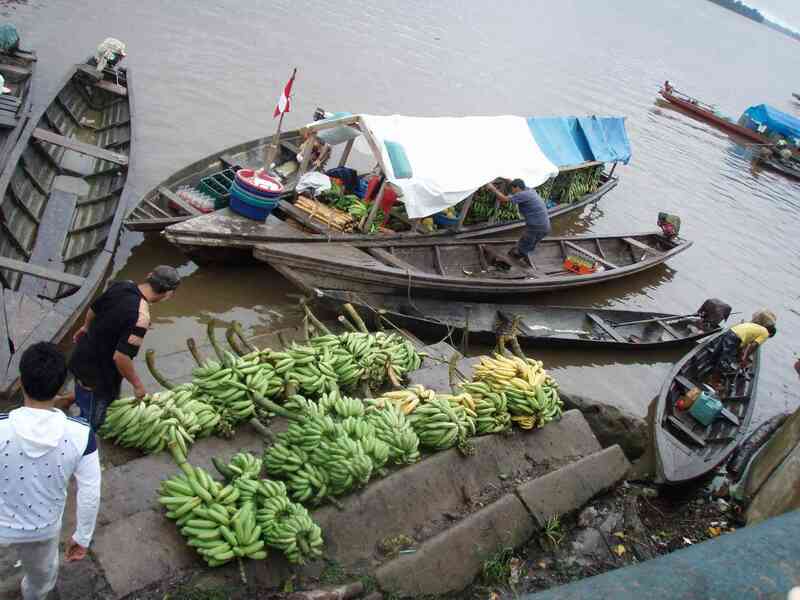 We visited a market and saw the boats that take bananas and other produce from the jungle region downriver to Iquitos. Finally it was time to return to Lima and get ready for another week of teaching and teacher training. Nancy: I was sad to leave the jungle. We left in a covered boat, and traveled back to Iquitos. On our way we had one more treasured experience. As we gazed out into the river we finally saw the small pink dolphins frolicking in the water. The captain of the boat stopped so that we and the other tourists could take pictures. Our guide Abelardo then allowed us about an hour to visit in the city of Iquitos and rest at a local hotel before actually having to arrive at the airport. We were all tired, and tried to escape the smell of fuel from the motorcycle taxis, and the noisy activity of the city. We found the riverbank area where people like to congregate. The walks were fairly dirty and there was lots of construction going on. 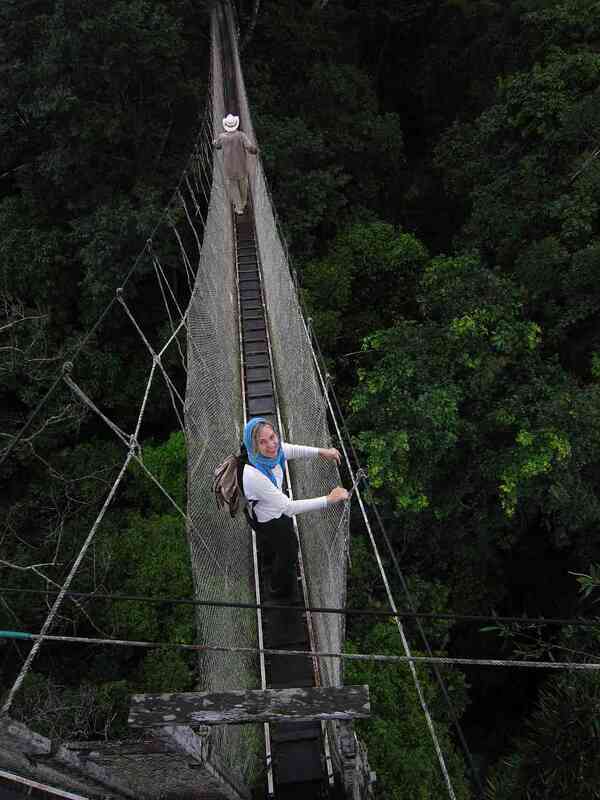 We longed for some clear pure air, and the quietness of the jungle! After all the magic of the trip, we prepared for our flight back to Lima. Back in Lima, we were awake with the birds, about 5:30 a.m. There is a Peruvian bird that looks like our pigeon, but has a very melodic call with a minor third. The sun begins the day early and with a vengeance. We can hardly wait to open the windows when we get up. They have to be closed at night to avoid the bugs flying or crawling in! Our adventures all centered around the main purpose of our trip, and that was to help teachers and students be enriched by the Suzuki approach to education. It is always so gratifying to work with them, as they are so eager to learn. I have been to Peru enough years to observe the amazing growth and development of the work being done. What a privilege it has been to teach here. Daniel has told me that his project in the jungle community is on hold at the moment. He was funding it himself and it became too much. He is working on looking for financial support. His first step i n the project is to build a boat and buy a motor so that they don’t have to rely on commercial transportation. A teacher in California gave me $200 for his program, so that is a start. They need about $900 for the boat. …Mi alumna [de flauta traversa] esta muy feliz porque gracias a la practica de la flauta empezo a sentir mas confianza en tocar las canciones, y que la musica forma parte de su vida y que por medio de la filosofia Suzuki le empezo a gustar mas la musica clasica y que ahora forma parte de su vida y que logro educar su oido, mejorar la audicion, lograr concentracion y continuidad, perseverancia en la practica. Mariana logro tener una rutina, responsabilidad, alegria en tocar y felicidad al cumplir una meta, al sacar las notas agudas que no le fue facil al inicio y en tener un lindo sonido, en el repertorio de lo mas sencillo a lo mas complicado con piezas y ejercicios divertidos al hacer la clase grupal con la cabeza de la flauta. Ademas, logro tener un conocimiento mas amplio con la musica y en especial la musica clasica y eso le hacia sentir diferente con sus demas companeros del colegio. Conversando con la mama, ella se siente feliz que haya aprovechado el tiempo en aprender y desarrollar esta habilidad de que en otros chicos lastimosamente no saben ni conocen de la filosofia Suzuki y al raiz de eso encontro mas confianza, nobleza y una sensibilidad e interpretacion al verla tocar la flauta a su hija Mariana. Finalmente, estoy ensenando a tocar la flauta dulce a jovenes de bajos recursoso economicos donde no recibo un pago.. solo es el servicio que brindo en ellos.. por ejemplo este ano a finales de enero voy a empezar a ensenar a 3 ninos de un horfanatorio y los demas ninos tocaran flauta dulce. De verdad… todos estan super encantados que aqui en la selva haya la flauta traversa porque era muy dificil conseguirlo y para este proximo ano voy a gestionar apoyo de las autoridades locales de la ciudad para que le puedan dar la oportunidad a esos ninos del albergue a que puedan participar en un festival Suzuki! Ese sera mi meta. Previously printed in American Suzuki Journal 41.2. Reprinted with permission. 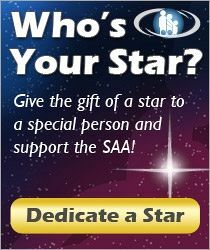 Copyright © 2013 Suzuki Association of the Americas, Inc.